The drug is manufactured in 20 ml polymeric dropper bottles and 50 ml amber glass bottles sealed by polymeric tamper-evident cup with a syringe dispenser. Bottles are individually packed in cartons with a package insert. Contains only natural vegetable components. No contraindications for pregnant and lactating animals. Effectively removes symptoms of urinary system inflammation. Reliable prevention of urinary stone disease. Urolex urology drops fall into complex vegetable drugs providing diuretic and antiseptic properties. 1 ml contains birch leaf dry extract - 25 mg, bearberry leaf dry extract - 25 mg, bottle brush dry extract - 25 mg, Canadian goldenrod dry extract - 25 mg (as active ingredients). Vegetable components of Urolex urology drops provide diuretic, anti-inflammatory, antibacterial, antihemorrhagic and anesthetic effects. The drug decreases probability of salt crystallization in bladder. 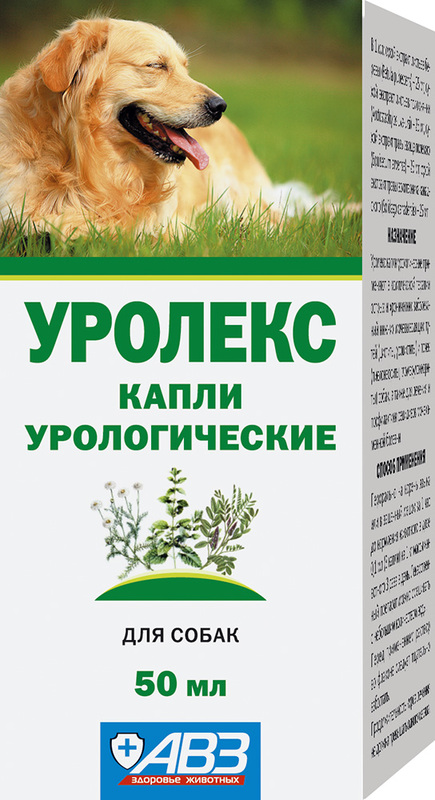 Use Urolex urology drops in complex therapy of canine and feline acute and chronic diseases of lower urinary tract (cystitis, urocystitis) and kidneys (pyelonephritis, glomerular nephritis), as well as for treatment and prevention of urinary stone disease recurrences. Individual increased sensitivity to the drug components. Administer 0.1 ml (3 drops) per 1 kg of body weight of Urolex urology drops orally (on the base of tongue or in the cheek pouch) an hour before feeding for 3 times a day. You may mix the drug with small amount of water. Before use accurately shake a bottle with solution. Treatment course is up to 1 month. Adverse events and complications are generally not observed in case of Urolex urology drops administration as per package insert. Store Urolex urology drops in closed original package. Protect from direct sunlight and moisture. Store separately from food and animal feeding at 5-30°С. Shelf life is 18 months from manufacturing date when stored in accordance with regulations. Do not use after shelf life termination.